Tech Week: Video Game Console Sites Attacked; Uber's Crazy Year : All Tech Considered In our weekly roundup of tech headlines, Sony and Microsoft video game console sites streaming The Interview were possibly hacked, and a look at Uber's year of hyper-growth and backlash. 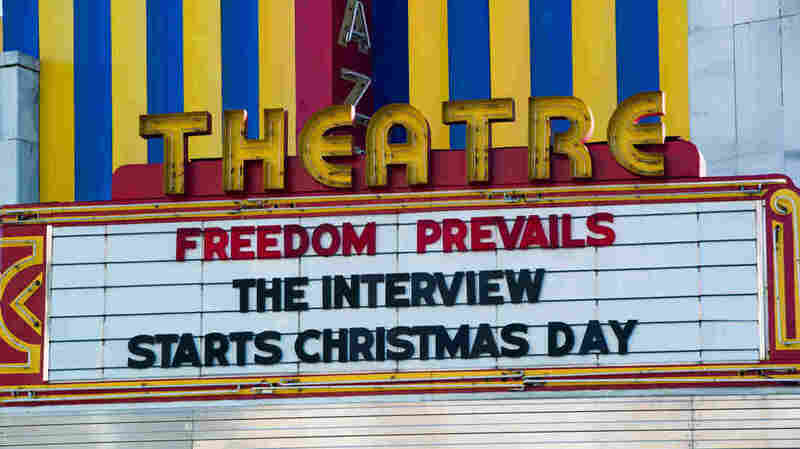 The Interview starring James Franco and Seth Rogen opened in 331 mostly independent theaters and on streaming sites Christmas Day. It's estimated to rake in $4 million in its opening weekend. This week in tech, Sony's $44 million comedy film, The Interview, opened to mostly sold out shows Friday. But on the streaming end, Microsoft and Sony experienced significant outages in networks used by their Xbox and PlayStation video game consoles. Also this week, we look at the global underground market for malware and a new startup that offers subprime loans for smartphones. Subprime Lending For Smartphones: A Silicon Valley startup called Better Finance is offering lease-to-own programs for smartphones. The program was designed so people could take a top of the line smartphone home same day but pay for it little by little over time. But as NPR's Aarti Shahani reports, inside retail stores these loan plans come with hefty markups. Uber's Brash Style: In our year-end piece on Uber, we examine the company's hyper-growth and subsequent criticism and legal battles in a number of cities. Like other companies before it, Uber sometimes appeared to flout the law in order to break through as one of the top tech startups in the country. Malware's Underground Market: NPR's Steve Henn reports on the growing underground malware market that holds the toxic codes of a cyberattack like the one North Korea is accused of unleashing on Sony Pictures. Developers build and sell small pieces of code on this global market, which are then combined to create a complete hack. Some of the code is malicious, while some is legitimate. The continuing fallout from the hack on Sony is still the big story in tech this week. North Korea experienced a widespread Internet outage Monday for more than nine hours. It is not clear yet what caused the disruption in service. The Interview opened Thursday with analysts predicting that the movie will earn $3 million to $4 million at the box office this weekend, The Los Angeles Times reports. Sony originally cancelled the movie's Christmas Day release after hackers warned of attacks on theaters showing the movie. After President Obama's end-of- year news conference last week, in which he called the company's decision to pull The Interview "a mistake," Sony changed its mind about the movie. On Christmas Eve, the company announced it would stream the movie on YouTube Movies, Google Play, Microsoft's Xbox video and a dedicated website for $5.99. In addition, 331 mostly independent theaters agreed to screen the movie. The film's release went smoothly for the most part, but Sony and Microsoft experienced outages on its video game console sites streaming the movie. In a series of tweets, a group of hackers called the Lizard Squad claimed responsibility for the outage and promised to restore access if it was retweeted enough times. Samantha Raphelson is a producer for NPR.org. You can reach out to her on Twitter.